It is crucial to use all of the sources available to us – including newspapers and the census. I was researching my cousins, James Edwin Ayres (1817-1893) and his wife Ann Ford (1817-1901), in GenealogyBank’s Historical Newspaper Archives. I quickly found an article about their marriage, on 22 October 1840, listed in the Westchester Herald. The newspaper article tells me that they were married in Sing Sing, New York, where she lived, and that he was from New Canaan, Connecticut. Next, I searched the census in GenealogyBank. Here they are listed in the 1850 Census for Greenburgh, Westchester County, New York. With a click of the blue “View Image” button I can see this census page. This census record lists their three children: James H. (born in 1842), Sarah (born in 1844), and Frederica (born in 1849). Looking at this family closely, we see that there is a noticeable five-year gap in the ages of the two youngest children: Sarah is six and Frederica is one year old. These gaps are often the most difficult to research – yet sometimes they are pivotal in completing our family history. Death was something people in 1850 were all too familiar with. The life expectancy was approximately 39 years. Infant mortality was shockingly high – roughly 22 out of every 100 children died as infants. Is there another Ayres family member that the above record does not reveal? Was there a child born after the 1840 Census who died before the 1850 Census? A little digging through GenealogyBank’s Historical Newspaper Archives turns up the answer, and a painful part of the Ayres’ family history comes to light. In the 12 December 1848 issue of the Hudson River Chronicle (Sing Sing, New York) is an obituary for the daughter of James and Ann Ayres: Lovina Ayres, who was born 7 August 1846, and died 26 November 1848. And there is more. Accompanying the obituary, the family inserted this notice – and suddenly the personal connection is made, and we can feel the Ayres’ sorrow. 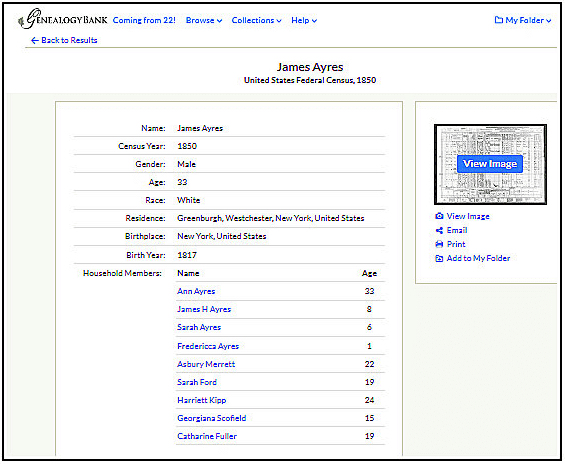 James died in 1893 and Ann lived to 1901 – so, Ann (Ford) Ayres will be in the 1900 census. Here she is, living with her daughter Frederica Ayres. The census gives us more clues. Question number 8 of the 1900 census tells us her marital status. She responded that she was a widow. Her responses were 8 and 5 respectively – so, three children had died. We know about Lovina who died in 1848. So, we need to search for obituaries for her husband and the other children that died. Here is his obituary. Newspapers and the census are excellent partners in providing the family details we need in genealogy research. 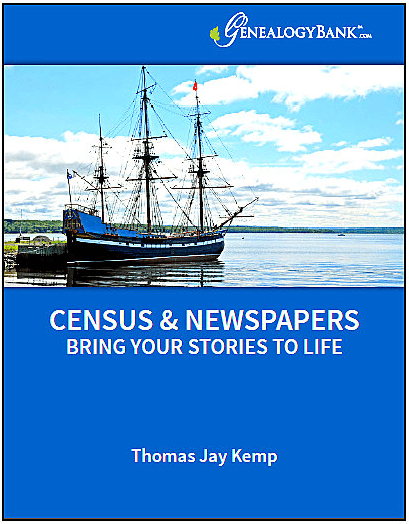 Your GenealogyBank.com membership now includes access to the U.S. Federal Census records from 1790-1940. Here’s a helpful research guide illustrating how combining these two powerful resources gives you the opportunity to build on the facts found in both sources to quickly locate family details and stories. If you haven’t had a chance to review, you can download this free research guide here.